Robot Professional Wrestling Match, `Dekinnoka!9`, sponsored by Omata-san took place in Soka City on Nov 3, 2011 during the 3rd Soka Fusasara Festival. Open rehearsal 10:15 am to 11:30 am and two stages were carried out, the 1st one took place 12:00 am to 1:15 pm and the 2nd one 1:45 pm to 3:00 pm (JST). 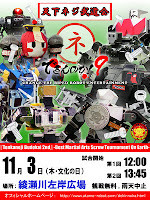 Dekinnoka!9 was held as Tenkaneji Budokai 2nd (Best Martial Arts Screw Tournament On Earth 2nd). 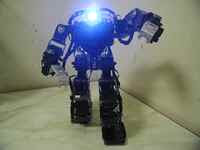 My custom-built robot `BLACK TIGER NEO` also joined as `Nagare-BLACKTIGER`. 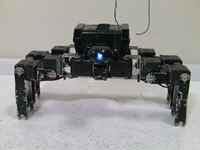 `BLACK TIGER NEO` had autonomous fighting system, however `BLACK TIGER NEO` fought through radio control in the Tenkaneji Budokai. 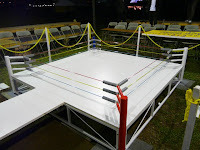 President Mister Tamao of Robot Pro-Wrestling, who is Omata-san planned not only wrestling match but also the back story of each wrestler character such as a real pro-wrestling match. Promotion of Deknnoka!9 have been uploaded. Dekinnoka!9 was opened by AR-Dron flying. The flying robot was custom-built by Amino-san. 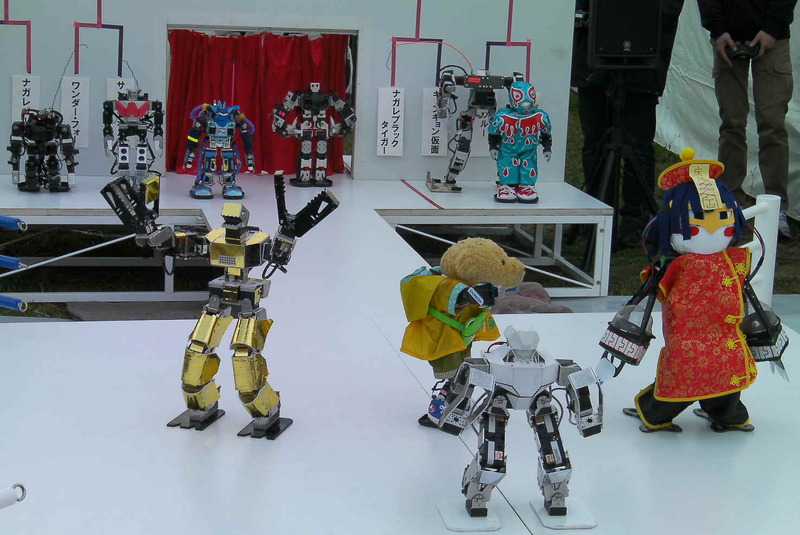 Eight robots joined the tournament were Nagare-Gold, Zerfar, Thunderbolt, Wadahoo, Nagare-BLACK TIGER, Kyonkyon-Kamen, Waroo and G-Saaga. 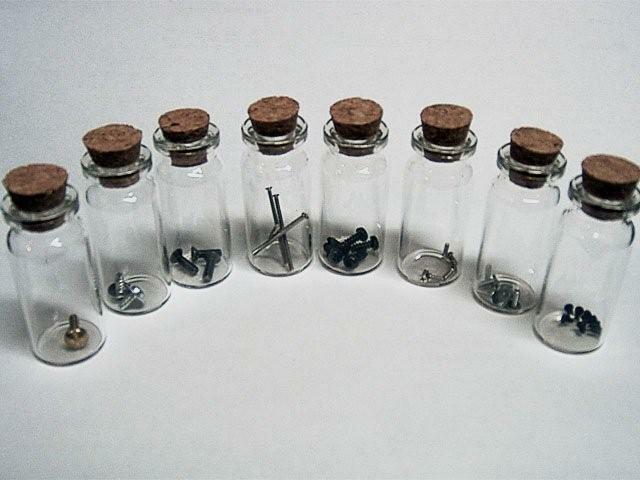 Each robot had one Dragon Screw and the winner of each match could get all screws. Fighting rule was as follows; the winner was the robot which dropped out of the ring or knocked down his opponent. The winner of the tournament, robot gotten 8 screws could call Nejiron, God of Screw. Nejiron would answer the winner's request. These storys were similar to those of `Dragon Ball`. The ramble match was carried out by the losers of matches. At first the 1st robot and the 2nd robot entered the ring and began fight, after 1 minute later the 3rd robot joined the fight, then every 1 minute another robot joined the fight. The ring rope of all side were removed for dropping out of ring. The winner was the robot survived on the ring. The winner was Thunderbolt. 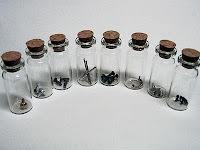 The winner was G-Saaga and got all eight screws. The winner G-Saaga asked Nejiron that he could have a match with Hammerhead, one of 4 God Robots of Kansai-District. Nejiron answered that his wish would be fulfilled in the nest year. 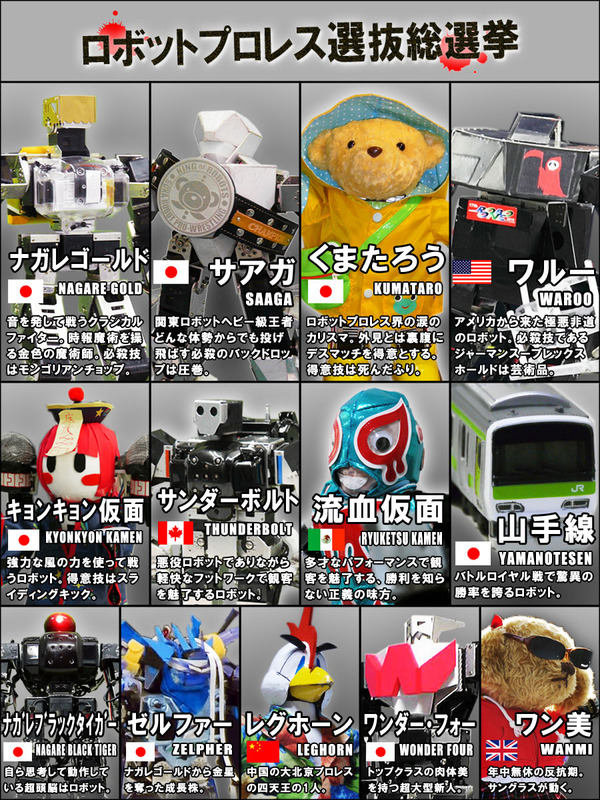 General election of all robot joined the Robot Pro-Wrestling Dekinnoka! took place after the tournament. Audience voted to their favorite robots. 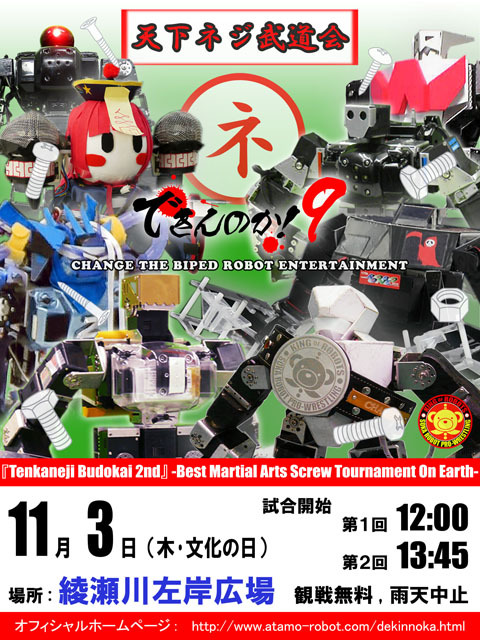 The 1st place robot would have the right to join the main event match in the Christmas Dekinnoka!10 which will take place at Tsukiji-Honganji Buddhist Hall in Tokyo on Dec 25, 2011. There were 246 votes. The 1st place was G-Saaga obtained 93 votes. The 2nd place was Nagare-Gold 30 votes, the 3rd place was Kumataro 22 votes, the 4th place was Kyonkyon-Kamen 17 votes and the 5th place was Leguhorn 13 votes. Omata-san carried out 9 times `Dekinnoka! as 1, 2, 2.5, 3, 3.5, 4, 5, 6, 7 and 8` during 3 years. `Deknnoka!` has been also supported by the members of Kanto-Training-Group. Reports of `Dekinnoka!`, `Dekinnoka!2`, `Dekinnoka!3`, `Dekinnoka!5`, 'Dekinnoka!6' , Dekinnoka!7' and `Dekinnoka!8` have been uploaded in this blog. Videos were also uploaded to the 'Dekinnoka Official Site` by Omata-san. 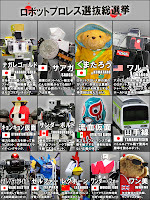 You can watch the details of the Robot Professional Wrestling videos by clicking each 10 poster of `Deinnoka! 1, 2, 2.5, 3, 3.5, 4, 5, 6, 7 and 8`.